2. "Har!" 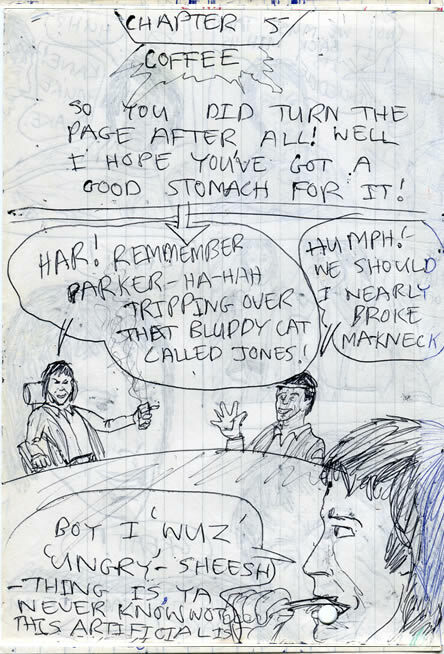 says one of the crew, pointing, "Remember Parker—ha-hah tripping over that bluddy cat called Jones!" "Humph!" snorts Parker, in response, "We should. I nearly broke ma kneck." Kane, changing the subject shovels another forkful of food into his hungry mouth and says, "Boy I wuz 'ungry—sheesh—thing is, ya never know what this artificial (food) is!" So, you did turn the page after all! Only to find - EEEEK!! 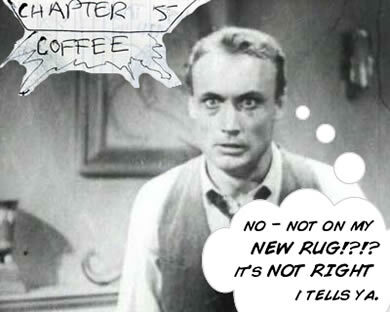 - that it'd be a chapter about someone spilling their coffee on the Nostromo's new carpet - knitted by nervy Lambert. splosh - spill - stain - ruin! AGGGGGGHHHH!!!!! The page on the left, from 1979, looks like it took about 10 minutes to scrawl! (Now, if I could only get back to that way of working - and sufficiently lower my critical faculties, I'll be bashing out comics like be-Jesus). - thing is (comma inserted) ya never know wot this artificial is'"
It's interesting: in the future, people will speak in a weird hybrid of stereotype Duelling-Banjo 'American' and lazy (London) Cockney. It makes sense doesn't it? Think about it.... You see? Perfectly logical (author hiding face in shame and embarrassment). NO. I DON'T KNOW WHAT I WAS THINKING. I - WAS - ELEVEN - DAMMIT! Who is that supposed to be on the left? Brett? 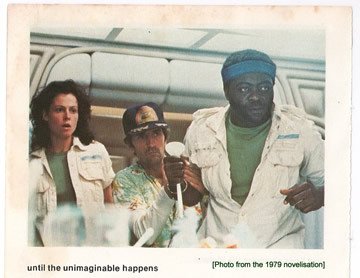 Brett's a total unknown character in this version of ALIEN. I kept on seeing him in that photo - as a kid, without realising it was him! Kane's sort of generic too. I wouldn't have ever even heard of John Hurt at the time. It's funny: I probably first saw him in the much more - crawl inside your brain forever - horrific 10 Rillington Place late at night - on my own - before I ever saw ALIEN. The irony. I spent 5 happy hours on Saturday night/Sunday morning, while I had the house to myself, attempting to draw page 1 of a brand new comic that I plan to publish online. To see what happens and where it takes me creatively. It's a shocker when you realise the time involved. 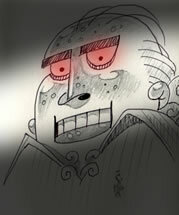 Of course, much of it comes down to experience, but also to style and how picky you are as an artist. Anyway, 5 hours gave rise to a black-inked page with speech balloons. Apparently that's pretty average, but I have a full time job and a family! More from the '70s on Wednesday!